Frost is a thin layer of ice on a solid surface, which forms from water vapor in an above freezing atmosphere coming in contact with a solid surface whose temperature is below freezing, and resulting in a phase change from water vapor (a gas) to ice (a solid) as the water vapor reaches the freezing point. In temperate climates, it most commonly appears on surfaces near the ground as fragile white crystals; in cold climates, it occurs in a greater variety of forms. The propagation of crystal formation occurs by the process of nucleation. The ice crystals of frost form as the result of fractal process development. The depth of frost crystals varies depending on the amount of time they have been accumulating, and the concentration of the water vapor (humidity). Frost crystals may be invisible (black), clear (translucent), or white; if a mass of frost crystals scatters light in all directions, the coating of frost appears white. 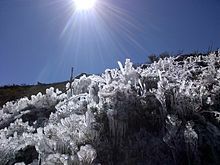 Types of frost include crystalline frost (hoar frost, hoarfrost, radiation frost) from deposition of water vapor from air of low humidity, white frost in humid conditions, window frost on glass surfaces, advection frost from cold wind over cold surfaces, black frost without visible ice at low temperatures and very low humidity, and rime under supercooled wet conditions. 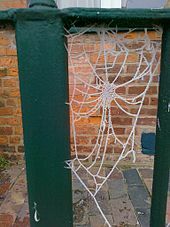 Hoar frost, also hoarfrost, radiation frost, or pruina, refers to white ice crystals deposited on the ground or loosely attached to exposed objects, such as wires or leaves. They form on cold, clear nights when conditions are such that heat radiates out to the open air faster than it can be replaced from nearby sources, such as wind or warm objects. Under suitable circumstances, objects cool to below the frost point of the surrounding air, well below the freezing point of water. Such freezing may be promoted by effects such as flood frost or frost pocket. These occur when ground-level radiation losses cool air until it flows downhill and accumulates in pockets of very cold air in valleys and hollows. Hoar frost may freeze in such low-lying cold air even when the air temperature a few feet above ground is well above freezing. When surface hoar covers sloping snowbanks, the layer of frost crystals may create an avalanche risk; when heavy layers of new snow cover the frosty surface, furry crystals standing out from the old snow hold off the falling flakes, forming a layer of voids that prevent the new snow layers from bonding strongly to the old snow beneath. Ideal conditions for hoarfrost to form on snow are cold clear nights, with very light, cold air currents conveying humidity at the right rate for growth of frost crystals. Wind that is too strong or warm destroys the furry crystals, and thereby may permit a stronger bond between the old and new snow layers. 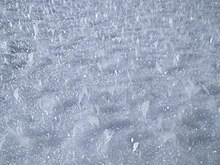 However, if the winds are strong enough and cold enough to lay the crystals flat and dry, carpeting the snow with cold, loose crystals without removing or destroying them or letting them warm up and become sticky, then the frost interface between the snow layers may still present an avalanche danger, because the texture of the frost crystals differs from the snow texture and the dry crystals will not stick to fresh snow. Such conditions still prevent a strong bond between the snow layers. Window frost (also called fern frost or ice flowers) forms when a glass pane is exposed to very cold air on the outside and warmer, moderately moist air on the inside. If the pane is not a good insulator (for example, if it is a single pane window), water vapour condenses on the glass forming frost patterns. With very low temperatures outside, frost can appear on the bottom of the window even with double pane energy efficient windows because the air convection between two panes of glass ensures that the bottom part of the glazing unit is colder than the top part. On unheated motor vehicles the frost will usually form on the outside surface of the glass first. The glass surface influences the shape of crystals, so imperfections, scratches, or dust can modify the way ice nucleates. The patterns in window frost form a fractal with a fractal dimension greater than one but less than two. This is a consequence of the nucleation process being constrained to unfold in two dimensions, unlike a snowflake which is shaped by a similar process but forms in three dimensions and has a fractal dimension greater than two. Rime is a type of ice deposition that occurs quickly, often under heavily humid and windy conditions. Technically speaking, it is not a type of frost, since usually supercooled water drops are involved, in contrast to the formation of hoar frost, in which water vapour desublimates slowly and directly. Ships travelling through Arctic seas may accumulate large quantities of rime on the rigging. Unlike hoar frost, which has a feathery appearance, rime generally has an icy, solid appearance. Many plants can be damaged or killed by freezing temperatures or frost. This varies with the type of plant, the tissue exposed, and how low temperatures get: a "light frost" of −2 to 0 °C (28 to 32 °F) will damage fewer types of plants than a "hard frost" below −2 °C (28 °F). Even those plants that tolerate frost may be damaged once temperatures drop even lower (below −4 °C or 25 °F). Hardy perennials, such as Hosta, become dormant after the first frosts and regrow when spring arrives. The entire visible plant may turn completely brown until the spring warmth, or may drop all of its leaves and flowers, leaving the stem and stalk only. Evergreen plants, such as pine trees, withstand frost although all or most growth stops. Frost crack is a bark defect caused by a combination of low temperatures and heat from the winter sun. Certain bacteria, notably Pseudomonas syringae, are particularly effective at triggering frost formation, raising the nucleation temperature to about −2 °C (28 °F). Bacteria lacking ice nucleation-active proteins (ice-minus bacteria) result in greatly reduced frost damage. deploying powerful blowers to simulate wind, thereby preventing the formation of accumulations of cold air. There are variations on this theme. One of them is the selective inverted sink prevents frost by drawing cold air from the ground and blowing it up through a chimney. It was originally developed to prevent frost damage to citrus fruits in Uruguay. In New Zealand, helicopters are used in a similar function, especially in the vineyard regions like Marlborough. By dragging down warmer air from the inversion layers, and preventing the ponding of colder air on the ground, the low-flying helicopters prevent damage to the fruit buds. As the operations are conducted at night, and have in the past involved up to 130 aircraft per night in one region, safety rules are strict. Although not a dedicated method, wind turbines have similar (small) effect of vertically mixing air layers of different temperature. Such measures need to be applied with discretion, because they may do more harm than good; for example, spraying crops with water can cause damage if the plants become overburdened with ice. An effective low cost method for small crop farms and plant nurseries, exploits the latent heat of freezing. A pulsed irrigation timer delivers water through existing overhead sprinklers at a low volumes to combat frosts down to −5 °C (23 °F). If the water freezes it giving off its latent heat, preventing the temperature of the foliage from falling much below zero. ^ Lindow, Stephen E.; Deane C. Arny; Christen D. Upper (October 1982). "Bacterial Ice Nucleation: A Factor in Frost Injury to Plants". Plant Physiology. 70 (4): 1084–1089. doi:10.1104/pp.70.4.1084. PMC 1065830. PMID 16662618.